We are engaged in manufacturing and supplying an ample range of Battery Discharge Indicator. We use modern technology and technically developed machinery to manage the timely production and authenticate the quality of the products in various industrial specified parameters. These products are good resistant to corrosion and rusting. 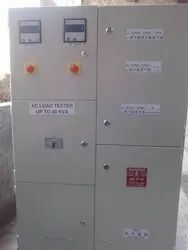 We are manufacture of load bank. resistive load for discharges or test on UPS, DG SET and BATTERY BANK. Power AC and DC. Looking for Battery Load Testers ?